It's Almost SCOTober at EW! Look what's coming, lads and lassies! LOTS and LOTS of new Season 3 PHOTOS!! 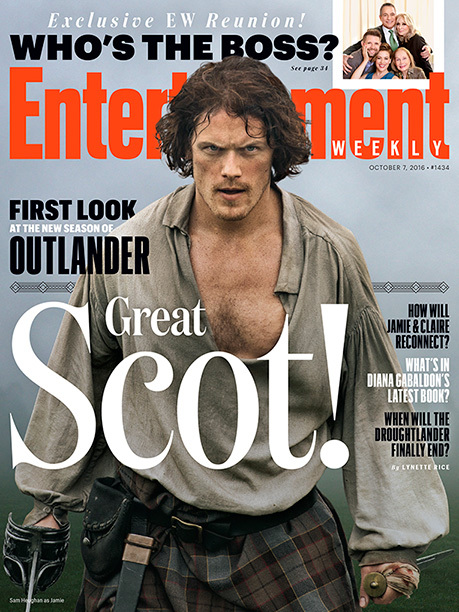 Get your copy of Entertainment Weekly TOMORROW, September 30th! WEE IAN and JOE ABERNATHY, Y'all!!! Beverly Hills, Calif., September 20, 2016 – Starz, in association with Sony Pictures Television, has announced today that two key roles have been cast in Season 3. 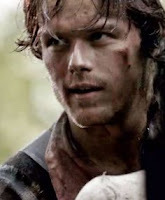 Joining Jamie’s (Sam Heughan) world in the 18th century, John Bell (“The Hobbit: The Battle of the Five Armies”) will play the role of “Young Ian.” Joining Claire’s (Caitriona Balfe) world set in Boston in the 20th Century, Wil Johnson (“Waking the Dead”) will play her friend and medical colleague, Joe Abernathy, in the hit series “Outlander.” The series is based on Diana Gabaldon’s international best-selling books and adapted by Ronald D. Moore (“Battlestar Galactica,” “Star Trek: Deep Space Nine,” “Star Trek: The Next Generation”). Young Ian Murray is a tall, gangly Scottish lad with a heart of gold, a stubborn streak and a penchant for getting into trouble. 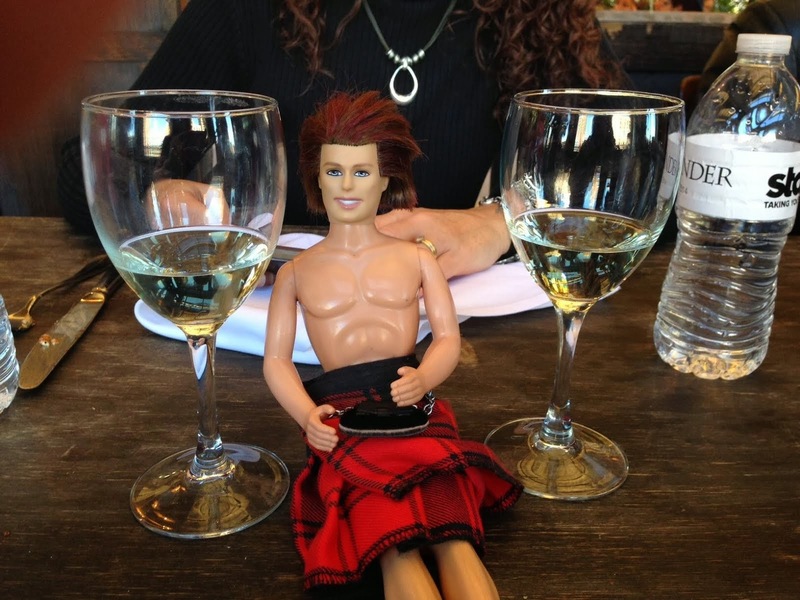 Bursting with charm, he’s more like his adventurous, fierce uncle Jamie Fraser than his farmer father Ian -- but when we meet him, he is still a very gawky boy. However, he keeps trying to prove that he is a man and we will see him grow into quite a formidable one as the series evolves. John Bell, 18, has been acting professionally since winning a small part in Doctor Who at age 10 by entering a competition on BBC’s Blue Peter. His career took off from there and he has been working in TV and film since that lucky start. He played Helius in “Wrath of the Titans” directed by Jonathan Liebesman and then went to New Zealand to play Bain in “The Hobbit – The Desolation of Smaug” and “The Hobbit – The Battle of the Five Armies” both directed by Peter Jackson. Bell’s TV career includes recurring roles in BBC Scotland’s “Life of Riley” and CBBC’s “Tracy Breaker Returns” as well as roles in “Midsomer Murders” and the TV mini-series “Hatfields & McCoys” for the History Channel. Joe Abernathy is a fellow doctor-in-training whom Claire befriends in medical school. Intelligent, charismatic, with a wry and irreverent sense of humor, Joe is a loyal confidant with great affection for Claire. He puts on a good face, but he is all too aware of his place in the Civil Rights era. Joe and Claire both feel out of place in the mostly all-white, all-male medical field, which bonds them together in a life-long friendship. Wil Johnson has a distinguished career in TV, film and theatre. 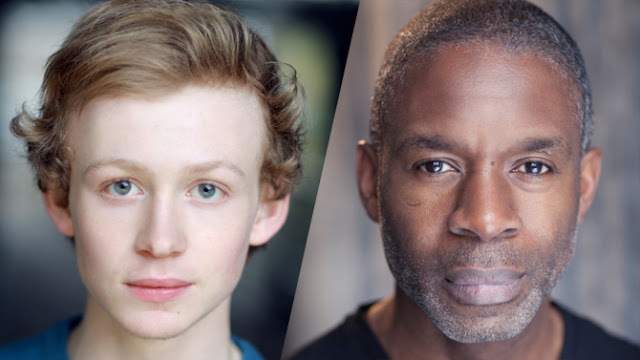 His TV credits include recurring roles on key British dramas such as “Waterloo Road,” “Holby City,” “Cracker,” “Babyfather” and “Waking the Dead.” He will soon be seen in Kit Monkham’s feature film of Macbeth and was also in Noel Clarke’s Adulthood. His theatre career spans all genres, including taking on the iconic role of Othello at the Royal Lyceum Theatre’s production directed by Mark Thompson. “Book Three” will be based on the third of eight books in the “Outlander” series, entitled “Voyager.” The third season of “Outlander” picks up right after Claire travels through the stones to return to her life in 1948. Now pregnant, she struggles with the fallout of her sudden reappearance and its effect on her marriage to her first husband, Frank. Meanwhile, in the 18th century, Jamie suffers from the aftermath of his doomed last stand at the historic battle of Culloden, as well as the loss of Claire. As the years pass, Jamie and Claire attempt to make a life apart from one another, each haunted by the memory of their lost love. The budding possibility that Claire can return to Jamie in the past breathes new hope into Claire’s heart… as well as new doubt. Separated by continents and centuries, Claire and Jamie must find their way back to each other. As always, adversity, mystery and adventure await them on the path to reunion. And the question remains: When they find each other, will they be the same people who parted at the standing stones, all those years ago? Ronald D. Moore, Maril Davis, Matthew B. Roberts, Toni Graphia, Anne Kenney and Andy Harries serve as executive producers of “Outlander,” which is produced by Tall Ship Productions, Story Mining & Supply Company and Left Bank Pictures in association with Sony Pictures Television. Spoiler Alert! 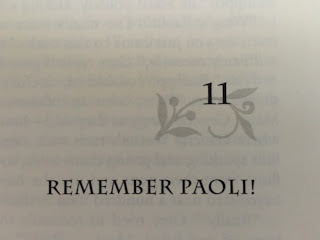 Dinna read unless ye have read Chapter 11, "Remember Paoli", in "Written in My Own Heart's Blood." ""We're taking him back to camp. You all heard what he said; Major General Charles Grey's kin to him. Might be as Colonel Smith will want to hang him in camp--or might even be as he'll want to send this man to General Wayne. 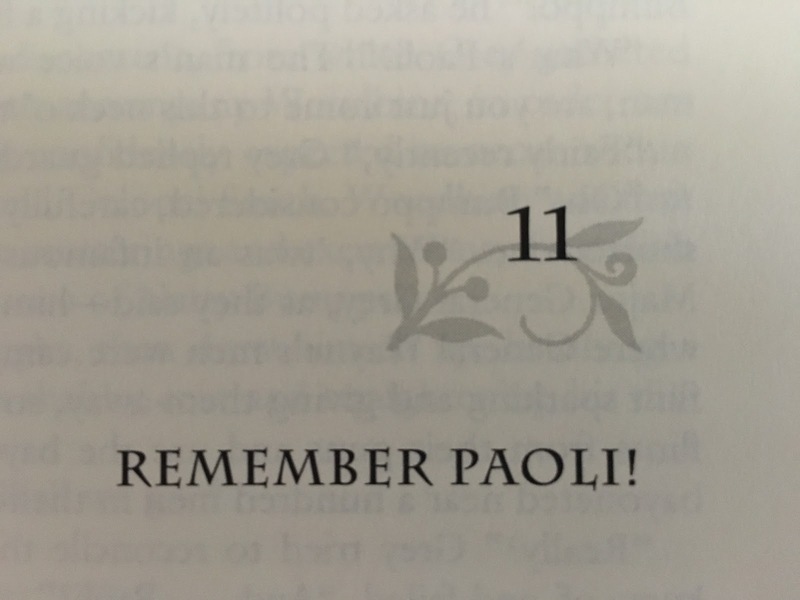 Remember Paoli!" ~ A treasured acknowledgement from Diana Gabaldon in Written in My Own Heart's Blood about her chapter, "Remember Paoli", written after she saw this post on My Outlander Purgatory. "You Don't Need A Man, You Need A Goddamn Warrior"
Well of course I couldn't let that one go. Nope. I immediately thought of only one warrior, the warrior none of us could imagine life without. The warrior who means something different - something awesome - to every single one of us. I have been meaning to mention this forever: Have you ever tried to watch something on TV, thinking it would be available on Netflix or On Demand, only to find out IT'S NOT??? Well here's what you do. *Buy an HDMI cable, attach it to your computer and TV, and stream the show/movie from your computer right onto your TV screen! The cable pictured above is an HDMI to HDMI cable, so it'll go from an HDMI port in your computer to the HDMI port in your TV. If you don't have an HDMI port in your computer, never fear, there are plenty of adapters available online! Trust me; it's worth it!!! Tom and I do this all the time! It's so disappointing when you want to watch something that's only available online. 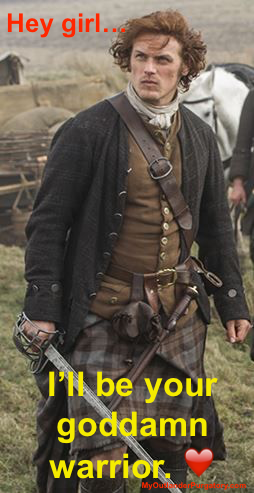 And let's be honest, who wants wants to watch Jamie Fraser on a teeny weenie computer screenie??? *This post contains affiliate links, which means that if you click on one of the product links and make a purchase, I’ll receive a small monetary compensation that helps offset costs of running this blog. Thanks for your support!